GO7 XSE Chartplotter, 7-inch display with GPS, CHIRP-enabled Broadband Sounder, StructureScanr HD, ForwardScan Sonar, Wi-Fi & Bluetooth Easy to Use Multi-Touch Display - The GO7 XSE offers true ease of use with intuitive touchscreen controls that smartphone and tablet users will find instantly familiar. Tap to create or select waypoints, pinch to zoom, or tap and drag to pan smoothly across charts. Simple home screen and menu layouts make all functions quickly accessible, with large and clearly-captioned icons that are easy to recognize and tap. 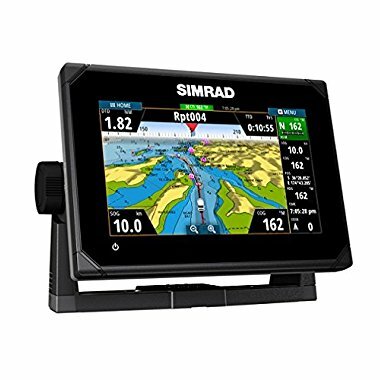 Chartplotter Navigation & Waypoint Management: The GO7 XSE is a full-featured chartplotter, with support for the widest available range of cartography options including C-MAP MAX-N, Navionics, Insight, Insight Genesis, and NV Digital Charts. Navigate confidently to destinations near and far, with the flexibility to choose charts that best fit your needs and location. Set and record those destinations easily with simple waypoint mangement: mark waypoints with a touch, and assign meaningful names that make it easy to look up your desired destination whether you've mapped out ten places or a thousand. Fully Customizable Interface: The Simrad GO7 XSE is fully customisable to suit your vessel and your favourite on-water activities - from power boating, to fishing, to water sports. Customise your home screen with shortcuts to the features you use most, and personalise it with your choice of wallpaper. Adjustable split-screen views and customisable panel layouts let you see everything you need on-screen at once, whatever your activity. Store: UnbeatableSale, Inc. Condition: Brand New Price: $1318.34 Total Price: $1318.34 Buy It from UnbeatableSale, Inc.
Last updated: April 20, 2019 at 12:03 EST. Pricing information is provided by the listed merchants. GoSale.com is not responsible for the accuracy of pricing information, product information or the images provided. Product prices and availability is subject to change. Any price and availability information displayed on amazon.com or other merchants at the time of purchase will apply to the purchase of the product. As always, be sure to visit the merchant's site to review and verify product information, price, and shipping costs. GoSale.com is not responsible for the content and opinions contained in customer submitted reviews.